For John Irwin, the new downtown Huntington office was not intended to be just another corporate space. With no doors on any of the offices, and with breakout spaces interspersed throughout each floor, the new office reflects Irwin’s intention for transparency and collaboration among employees and clients. As West Michigan Regional President for Huntington Bank, Irwin himself doesn’t even have a door on his office. Instead, he sits near the elevators, front and center, to welcome the flow of incoming traffic. 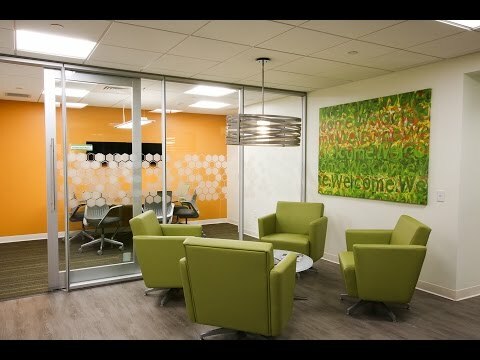 Custer was privileged to work closely with Irwin and his team as a part of the Huntington Bank relocation, providing furniture, finishes, workplace technology, soundmasking, and custom privacy screens. Within three expansive (and intricate) floors of the Trust Building, Custer worked alongside Huntington’s in-house architect and Concept Design to complete Huntington’s fit-out. Built in 1892, the old building was no simple upgrade. Despite its unique challenges as one of Grand Rapids’ oldest buildings, the renovated space is a reflection of contemporary workstyles and research. The new office space features height-adjustable workstations for every employee, multiple types of meeting rooms and postures, a work cafe for both socializing and working, and workplace technology throughout. The environment balances formal and informal meeting rooms, all of which are intended to be used by both customers and employees. To make the flexible space uniquely Huntington’s, finishes were selected that promoted the organization’s unique brand and corporate identity. Huntington’s characteristic green — with hints of orange — bring the brand to every inch of the office. To learn more about Custer’s design process for Huntington’s new office and branch location in downtown Grand Rapids, connect with us here.